More than 300 were killed in 5 bombings and other attacks and hundreds wounded. Attacks occurred all over Iraq, the majority in the capital city Baghdad. The Sadrists response is one of calm. This message from Sadr, while still hiding from U.S. troops. This whole thing is some kind of farce. 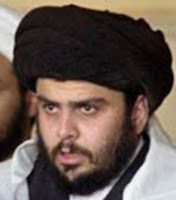 Even though Sadr could easily ratchet up the violence he is holding the Mahdi army back, He could easily force the collapse of the Iraqi government by pulling out his MP's, and forcing others to leave also. He does not. What is more farcical while this manhunt continues in Baghdad, the British are busy turning over territory to the Sadrists. British commanders ceded security responsibility for Maysan, a critical province with Iraq's longest Iranian border and large oil reserves, at a colorful outdoor ceremony and military parade. The Shiite province Maysan is held by the Sadrists, They turned security in Najaf over to the Badr Corp, and look for Kerbala to be next. Personally I find the strategy in Iraq more and more incoherent. Not that it ever was, but sometimes even crazy people get out of the rain. It seems to me, with rumors of Sistani being sick and Sadr's restraint and seeming growing maturity. He is, if not now, soon to be de-facto leader of Iraq.